My favorite advanced law of attraction technique is remembering. I developed it many years ago and have always had fantastic results with it. I really think remembering is the best law of attraction technique for overcoming resistance, changing beliefs, and seeing your desires manifest quickly. The remembering Law of Attraction technique works on the premise that your subconscious mind doesn't know the difference between what is real and what is imagined. Anything you think, it takes for fact and brings it to you. It doesn't matter whether it's something you think about someone you see walking down the street or something you visualize yourself manifesting. Since the subconscious mind doesn't know if something is real or imagined, it also doesn't know if if a memory is real or imagined. Typically, Law of Attraction visualization involves imagining something as if it you have it in the present. You're essentially bringing the future into the present moment. The remembering technique brings the future to the past. You're going way beyond having achieved your goal and looking back at things as if they had already happened. You're not trying to create something. You're simply remembering it. You're not trying to create a million dollars. You're remembering what it was like to have a million dollars. You're not trying to get your ex back. You're remembering what it was like when he or she came back. You're not trying to get a new job. You're remembering what your first day of work at your new job was like. You're looking back on the things that you want to create as if they have already happened. You're remembering the experience as if you were to think about what you had for dinner last night. What makes this advanced Law of Attraction technique really powerful is that it overcomes any doubts or blocks you may have to manifesting something. When you visualize, you can experience a feeling of wanting your visualization to be real…as if there's a chance it may not occur. When you remember something, it means it already has happened. There isn't a feeling of wanting. There isn't a chance it won't happen. It already has. What do you remember? Let me know in the comments below. Elizabeth, Thanks for the memories. I don’t sleep well. I’m remembering running and playing so much during the day that falling into bed felt so good I went right to sleep and I slept all night long without waking. That’s what I want to keep remembering so that it will happen again. That’s a great memory Faith! You’re very welcome Jackie! Merry Christmas! That’s perfect, thank you so much. Thanks Cindy! I’m glad you enjoy it. Amazing technique! Absolutely love reading things like this; it only re-enforces my confidence that I’m thinking the right way and that I am in the right place to conduct the things I want into my life more and more rapidly. If there are any more sources of litterature like this I would love to know where they are. God bless! I remember when my love text me out of the blue and said he misses me and loves me and cant live with out me, after this text he came round to my house and we spoke and got back together and we are now happily in a relationship again! After reading your comment Kiwi, I confess I am curious as to what’s currently going on with you. I remember when I got my perfect body and attracted my perfect partner. I still get goose bumps from excitement just thinking about it. Thank you Elizabeth, this technique is just like ‘dream dialoge’ by Jafree Owald which I started using two days ago. I’ve never tried it. If you do, let me know how it works for you! I think you know it but I share it for others like me. I name it The Double/Second Technique. It’s a mixture of Remembering and Visualizing. First, you remember (#Remembering_Technique) your desire as it is already manifested, then you try to attract it AGAIN/FOR THE SECOND TIME. It makes a feeling of proving the law of attraction again, remove doubts and really feels good. 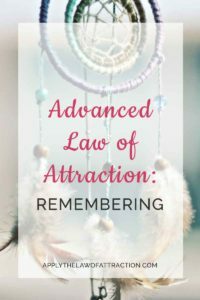 Make you to look at the LOA as a real LAW that every time works. And then, with this high vibration, you visualize your desire. I remembered: The last time I used law of attraction, I could manifest a cup of coffee. Wow! It was really exiting! The LOA worked! Then: I want to attract another cup of coffee again. I like this game. Let’s try another cup! And finally visualized the cup of coffee with the feeling of IT IS THE SECOND CUP THAT I ATTRACT IT. I just wanted to share this technique as a tool to help people to manifest their desire. For me, this technique made a feeling of IT’S NOT IMPOSSIBLE TO ACHIEVE IT; I HAVE THE EXPERIENCE TO ACHIEVE IT BEFORE. What a wonderful technique, Shayan! Thanks so much for sharing it! 🙂 It’s truly a great variation on the remembering technique that empowers you to realize the wonderful creator you are. I remember the first time that I picked up Chris at the airport. When I saw him, my heart was lifted and soared. We ran towards each other and our hearts danced together; nothing else was real. We naturally allowed our feelings for one another to flow. Later that day, we talked about how we both deeply want to be together, and have never loved another more deeply. I remember my gorgeous husband coming home from 10 days away in Angola with a new attitude to everything about us. He told me just how much he loves me, regrets every time he just didn’t understand what he was doing to me. He held me so tight, told me I’m the only one for him ever – and kept saying how sorry he was to have hurt me. He said I love you, I love you, I love only you, and I could see the truth of it all in his eyes – something had dramatically changed in him ! It was bliss! His new found passion for only me was evident for all to see and once more, he loved me more than Jaffa Cakes! All he wanted to talk about was plans to have lots of fun together in the future, to enjoy our son ‘together’ and be a full-on-fabulous couple forever ! Thank you for sharing your insights..It is really new and helpful. I am unemployed and I got a call for a job opening. they said will call after knowing interview time. But then they didn’t contacted me. Actually I got so excited and happy when they called and now am sad that they are not calling again. It is a placement company and they said they will forward my resume to the particular company. And now no revert from them. This job is a good offer and my dream job also. Can you please help me as what i can do to attract this particular interview. please do help. I am eagerly waiting for your reply. Sarika – Elizabeth explains how to use the law of attraction to attract a job in her book, Law of Attraction and Money. I remember buying a home lottery ticket, desiring the 1st prize of a beautiful home, imagining getting the keys and moving in with my family, then and I won it, the feeling was pure joy and bliss.